What did you do this holiday season to show a “giving” spirit instead of a “getting” spirit? Our class had an excellent opportunity to live out the saying, “It is better to give than to receive.” With the Christmas season, came the feeling that we wanted to make others happy. Two groups of people came to mind: the residents of the Aurora House Assisted Living Home and the staff members at our school, Peralta Trail Elementary. So, with a donation of cookie dough by a parent and Mr. Blomgren, our principal, we set out to bake cookies and create our own Christmas cards to give out to the teacher’s on Friday. 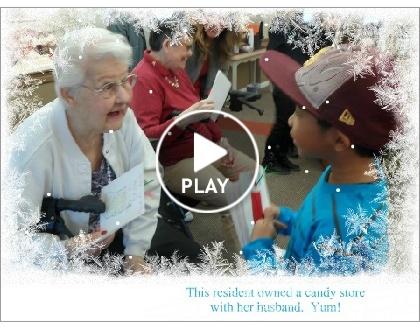 Then on Saturday, many of us met at Aurora House to share the cookies, some holiday cheer, and family traditions. When we left, there was a feeling of well-being because we knew that we had put others first. Mrs. Fraher here. We just received an update from the headmaster at Bensesa School in Nairobi, Kenya. After wiring the money to them through Western Union, they received it just in time.